Occasionally the architectural community has a big public argument, out in front of God and everybody. These arguments can have some entertainment value, but more seriously they reveal how big players make big decisions and how things really get done. This year’s revealing architectural argument started on West 53rd Street in New York in mid-April, when the Museum of Modern Art announced that they intended to flatten the former American Folk Art Museum, as part of their westward expansion on that block. This announcement instantly rubbed a lot of people the wrong way. The Folk Art Museum is a minor but elegant building, twelve years old and already well-loved. The good news, and it’s really almost heart-warming, is that the defenders of the Folk Art Museum have mobilized fast. Those defenders include Richard Meier, Steven Holl, Thom Mayne, and the New York Times. MOMA has felt significant pushback about this decision, so their plans may have changed. Right now they say they’re thinking it over. Part of the conversation is about how an institution partly dedicated to the preservation of modern architecture could propose this destruction to begin with. The Folk Art Museum gallery spaces and an upper-level auditorium had to be fit like interlocking puzzle pieces into a narrow lot (40 feet), so the interior took the shape of sort of an essay in vertical voids and borrowed space. The facade, though, is clearly a work of art, a folded plate of bronze panels, a deceptively simple design element that, in a single stroke, tricks the eye into forgetting the narrowness of the building, reconciles itself to sidewalk observers looking up, and communicates something about the improvised, hand-made character of Folk Art. That facade is photogenic in all different lights, touchable at street level, unmistakable, reminiscent of the best of Marcel Breuer’s humane touch in similar buildings. So you probably know where I’m headed with this. The husband and wife team are Tod Williams and Billie Tsien. That facade is Billie’s. Their reputation is stellar. Of the six or so interdependent tasks that architects take on (make the building safe, make the project economically viable, make it look good, make it environmentally responsible, contribute to the neighborhood, and serve its users), Williams & Tsien appear to specialize in all six. Its that user experience thing that doesn’t always happen at this level. Williams & Tsien are both artists and engineers, capable of brave wild gestures integrated with good solid pedestrian space-planning. That’s obvious at the Folk Art Museum, and at the hat-trick reconstruction of the Barnes Foundation in Philadelphia (oh God, another story entirely. Do you know that story? Did you know Albert Barnes used to send art-establishment people insulting letters signed by his dog? ), and at the Phoenix Art Museum. Thanks to the foresight of director Jim Ballinger and the board, Williams & Tsien were given the chance to design the museum not once but twice. The choice to return to the same firm was practical; it saved PAM six to nine months and thousands in structural knowledge and materials documentation and all that. More interestingly it was an opportunity for a firm to learn from its own 1996 design, which included, you might remember, strange but true features like a nearly-invisible front door and a nearly-invisible second story of galleries. Patrons would walk in, look through the first story, walk out perfectly happy. For the 2006 PAM the architects revised themselves, negotiated a hodgepodge of other existing structures, some dating back to Blaine Drake and oh, what’s his name, Alden Dow, and some firm demands from Mr. Ballinger for interior spaces free of all internal supports. If you haven’t been in awhile you might visit. Just to let those layered spaces roll over you. Beautiful architectural moments in there. 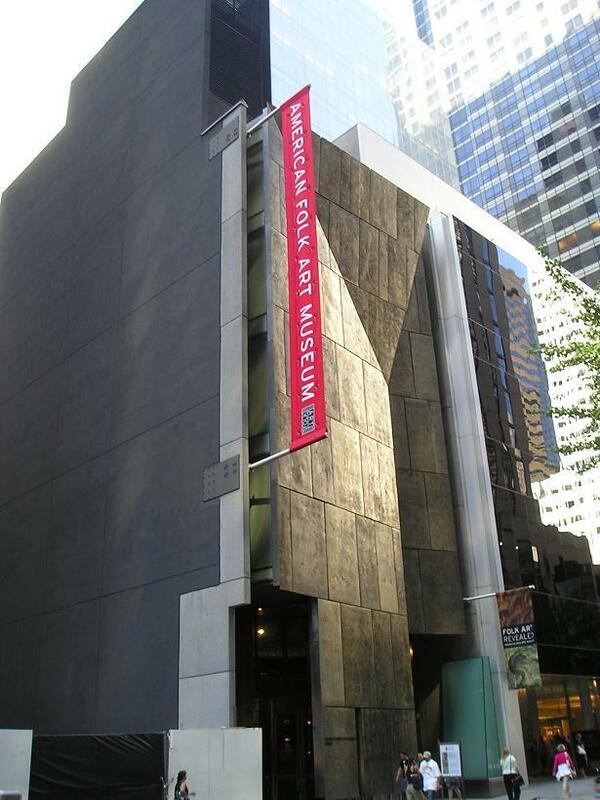 Whether or not the battle of gigantic egos on West 53rd Street will allow the Folk Art Museum to stand, I can’t think of another firm that deserves more attention. EDITORIAL NOTE: The New York Times reports that after impassioned protests from prominent architects, preservationists and design critics, the Museum of Modern Art recently announced that it would reconsider its decision to demolish the American Folk Art Museum, to make room for an expansion.